You are currently browsing the archives for the all tomorrows parties category. Day 3 of ATP began at 8am with the guys in the chalet next door singing along to Flight of the Conchords very loudly (and out of tune). Not quite the morning lie-in I was hoping for, but it at least had us out of bed early enough for The Ledge to watch Neil Young’s Greendale on ATP TV and for me to get my hands on an elusive copy of The Observer – something which usually proves difficult at Butlins. By early afternoon we were ready for some music so we headed up to Centre Stage for the entirely unironic ’70’s country soft rock stylings of Tim Chad & Sherry, featuring members of Silver Jews and Lambchop. It was, umm, well….what I fear the next My Morning Jacket album is likely to sound like. I hope not. It’s a huge step backwards in the evolution of music and one which makes me think of rednecks in pickup trucks drinking Bud Light in their white string vests in the summer Atlanta heat. 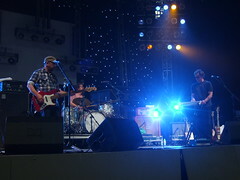 Next up was Wax Fang on the Main Stage. Not knowing what to expect after the brilliance of their version of Purple Rain, I can’t say I was particularly smitten. It seems Wax Fang are a little more interesting as Prince and the Revolution than as themselves. It was perfectly competent anthemic rock – but I don’t find competent anthemic rock all that inspiring. We quickly abandoned it to head upstairs for The 3Ds – one of those Flying Nun bands that The Ledge has been dying to see for about 20 years, and one of the few who had so far eluded him. I was expecting a jangly Flying Nun band heavily influenced by Sonic Youth. I could hear the jangly guitars, but the Sonic Youth influences were masked by the sheer volume of the sound the 3D’s were making. I was quite amazed that they appeared to be a band comprised of a guy found drinking cider in the park, my 50-something 6th grade English teacher, Mrs. Ruffin, and a guy who failed an audition for The Ramones. They sounded great, however, taking us right back to the great lo-fi, guitar-driven indie rock of the late ’80’s/early ’90’s. They weren’t particularly charismatic, but they have some great, immediately catchy tunes. After the 3D’s, we headed back downstairs to watch The Dodos, a band we’d enjoyed at the Night & Day about 18 months’ ago, but whose new album we’ve not heard. The previous performance was sat down and very folky. Yesterday they were, despite being an acoustic guitarist, a drummer and a xylophone player, incredibly rocky. The new songs sound very similar, if harder, than the old ones, all slightly off-beat indie pop. I enjoyed ‘Jody’ off their first album, but as we wanted to catch a bit of Boris performing Feedbacker, we departed about halfway through for Centre Stage. As for Boris, they were rather boring. I think The Ledge enjoyed the 15 minutes we watched, but I thought they would be a bit less by-the-book post rock. I hate post rock. Downstairs we found a good spot to watch The Clean, the other Flying Nun band that The Ledge had been waiting 20 years to see. They were even better than The 3Ds – catchy, immediate and full of smiles and friendly banter. I must admit that here at Indie Credential Towers we have a serious soft spot for post-Smiths, melodic, lo-fi, guitar-driven indie rock and this fits the bill 100%. I always love The Ledge’s old Flying Nun albums and I’m baffled at how The Clean have eluded me for so long. They were perfect! 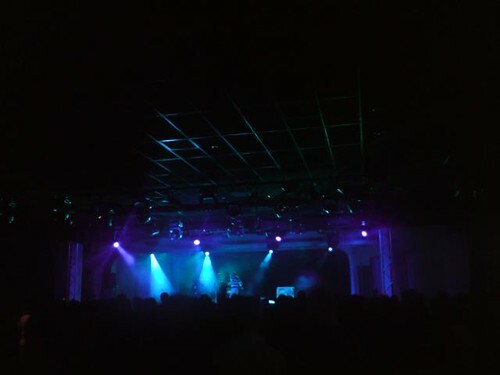 Finally came the day’s headliner, The Fall, always an interesting, if somewhat difficult live act. I’d only seen The Fall once before when they were an hour late on stage and a complete shambles live. It was a terrible gig which hadn’t made me want to see them a second time. However, I’d heard some reports of great recent gigs, so we decided to give it a go and were not disappointed. Although we only recognised one song, Festive 50 winner ‘Theme from Sparta F.C.,’ the driving, repetitive guitars and keyboards kept us mesmerised, despite the lack of familiarity. Mark E. Smith and band tore through the 70 minute set without pause and a rapt, but subdued crowd, at least where we were standing. Our final set of the weekend was a brief trip back up to Centre Stage to watch The Raincoats who sounded pretty much like I expected – quirky, friendly post-punk female pop songs which, at least to me, seem to be a huge influence on Fiery Furnaces. We were so exhausted by this point, however, that we abandoned the set for a pizza, a glass of wine and our beds, wary of the long drive in the morning. So, another May, another triumphant ATP and one that has left me extremely excited for our return for Bowlie 2 in December. File under all tomorrows parties,atp,dodos,Festival Reviews,Flying Nun,john peel bands. Before I begin, I’d like to apologise for the lack of pictures. Butlins seems to think Flickr is an adult site and won’t let us access it to upload any photos. We’ll try and get that sorted if we have a gap in the music! 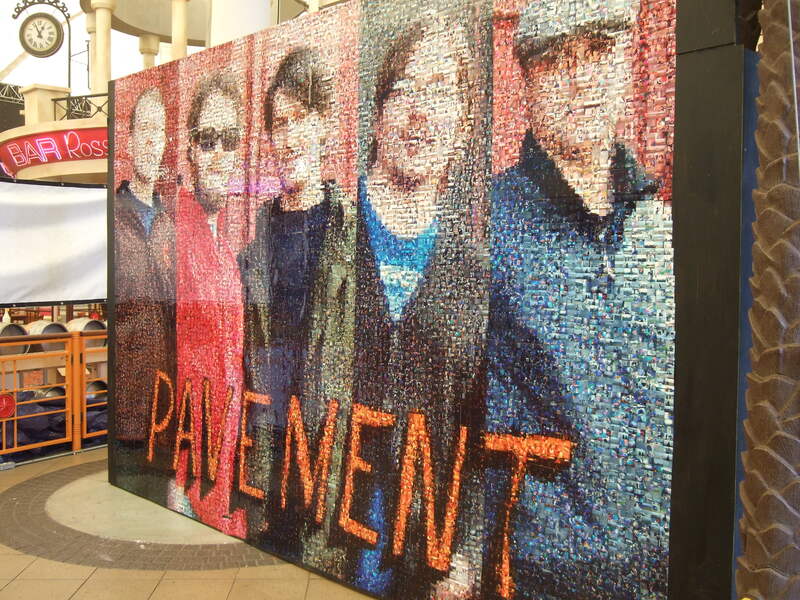 The Ledge, in particular, has been anticipating our 5th trip to All Tomorrow’s Parties in Minehead because Pavement are one of his favourite bands of all-time. He loves Pavement so much that he decided we were going have heard only that Pavement were curating. 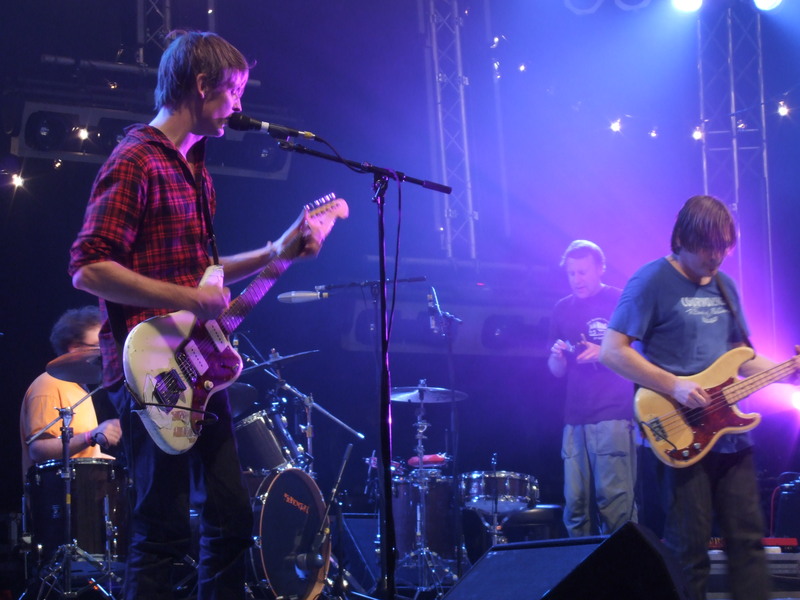 As I’m somewhat less keen on Pavement, he should count himself lucky that the final lineup turned out to be so good. The first band of the day, appearing on Centre Stage, were Avi Buffalo, from Long Beach, as they kept telling us, and who appear to be taking a lot of cues from The Shins. Where the songs tended towards upbeat, harmonic indie-pop with Delgadoes-esque harmonies they were fantastic. They dragged and meandered a bit on the slower songs, however. 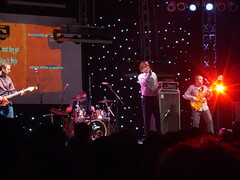 Basically, where the female keyboard player was singing, the songs were great, where she wasn’t, they were a bit boring. The single, ‘What’s in it For’, which Mark Riley has been playing on 6 Music, is an absolute delight. Although their stage presence was a bit muted, I’d put this down to the fact that they look about 18, are on their first trip to the UK and are clearly still finding their feet. The good bits of the set were good enough that I’d certainly check out an album. Next up was Surfer Blood on the main stage. Surfer Blood are one of those American west-coast, jangly surfer bands currently emerging alongside The Drums, Vivien Girls, Dum Dum Girls, Girls, Veronica Falls, etc. These guys, however, a clearly a cut above most of the others. The songs were immediate, the band were clearly having a blast and it didn’t take long for them to get the crowd humming along. The one ‘dark’ number was, musically at least, anything but, as the songs danced along quite merrily to lovely, light, folky guitar hooks and keyboards played by a guy with an immense afro which didn’t stop moving up and down through the whole set. I thought they were absolutely brilliant and in a just world, these guys will find themselves with the festival singalong hit of the summer. Following shortly on was Calexico, also on the main stage. The last time we saw Calexico was in Liverpool over 3 years ago. They didn’t tour the last album, so we weren’t sure what sort of set we would get. 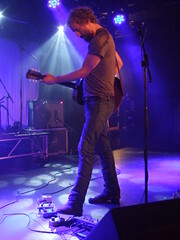 It turned out to be a mixture of more recent tracks, as well as a few classics including “The Crystal Frontier,” “Woven Birds” and “Not Even Stevie Nicks”, which even The Ledge enjoyed, despite disliking that track intensely, and which they blended with “Love Will Tear Us Apart” – something I’m sure they did the last time we saw it as well. There were far more straightforward rock songs in the set than expected, and the few mariachi-style tracks, including the classic ‘Minas de Cobre’, were welcome, and as high-spirited as ever. 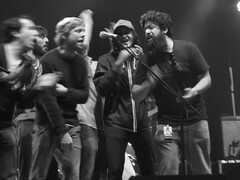 The finish of their cover of “Alone Again Or” was the perfect end to an excellent return. Finally, Broken Social Scene delivered a fantastic, energetic performance made up of mostly new material. As I’ve only heard the new album once, on the drive down, I couldn’t provide song titles, however, the new songs are far more immediate and a lot more direct than the tracks from the previous, eponymous, album. Highlights of the set were new track ‘All is All’ sung by Lisa Lobsinger, ‘7/4 Shoreline’, one of my all time BSS favourites ‘Superconnected’, ‘Cause=Time’ and ‘Fire Eye’d Boy.’ The band were even briefly joined by Spiral Stairs on backing vocals and mad dancing. In fact, the only downer on the performance were 2 girls who insisted on talking through the entire show, except when they were shouting along to the trumpet parts or singing the wrong lyrics at the top of their lungs. Broken Social Scene are always a force to be reckoned with live, the joyful delivery and the on-stage chaos are always uplifting and as always, the 75 minute show just didn’t seem long enough. After BSS finished we rushed up to Centre Stage to try and watch Mission of Burma deliver their ’80’s punk classics, but frankly, after about 15 minutes of the P.A. Cutting in and out and the songs sounding pretty much identical, we decamped for some food. I went back to the chalet to sleep and The Ledge went to watch Wooden Shjips – who he said generated a giant mosh pit and were very good, ending the set with a brilliant cover of Snapper’s ‘Buddy’, the first, but surely not the last, Flying Nun classic of the weekend. 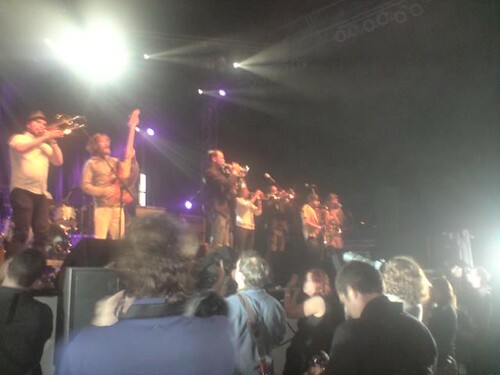 File under all tomorrows parties,broken social scene,Festival Reviews. Ok, let’s get this over with. We’ve kind of lost our blogging mojo for the minute but ATP deserves at least some sort of write up. This was our third year running at ATP and yet again it was a cracking weekend. Any negative comments you may have read further down the page were really minor quibbles and did not affect our enjoyment of proceedings one jot, mainly because we got to see Battles on the Sunday night after an act of generosity that came completely out of the blue. More of later, if I remember. We arrived. It was raining. We got the chalet next door to the one we got last year. We headed for Centre Stage to catch the festival’s opening band, The Constantines, and their solid, blue collar indie rock went down very well. The singer gave himself a haircut during the gig. Not sure why. Japanese post-rockers Mono were up next on the same stage were loud and completely unspectacular, but not a bad warm up for Dinosaur Jr, playing the first of their two Centre Stage sets. We thought we had a good spot at the front until they wheeled on J Mascis’ four Marshall stacks that were to form a cocoon around the aging slacker legend. I moved to get a better view while JustHipper made do with catching glimpses of the great man when he approached the mic to sing. It was a great set dominated, not surprisingly, by Mascis’ searing guitar work. 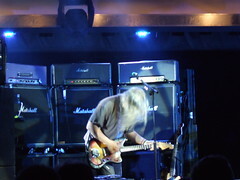 There was a good range of material on offer from set highlight “Forget The Swan” through to MTV breakthrough “Feel The Pain”, but there was slight disappointment at the end when the encore suggested on Mascis’ huge setlist (at least 3 pages of A4 with really big lettering – Mascis must be almost blind as well as almost deaf) didn’t materialise. Then it was off to the Skyline Pavilion where curators Explosions In The Sky made their one and only appearance, their great conceit for the weekend being a complete lack of activity on the other two stages while they were on. Now I, unlike JustHipper, like a bit of post-rock now and then but I’m not massively familiar with the Explosions’ back catalogue and found myself unable to really get into it and giving up after about half an hour. It would have been nice to have something else to go and see but instead it was Burger King and beer and the DJs in the Crazy Horse. Before long we were in the Reds bar watching The Octopus Project from afar as JustHipper complained that she was “all post-rocked out”. So was I, but they sounded a bit more interesting and varied than the curators. I’d heard enough of Phosphorescent to know that I desperately wanted to catch their set and, although I was practically dead on my feet at this stage and my companion made it through just one song before hauling herself off to bed, I stuck it out and was rewarded with a quite brilliant set of atmospheric folksy blues with plenty of excellent vocal looping from Matthew Houck (turns out it’s just one guy). I made a mental note to rush out and buy his latest album. Three weeks later and I still haven’t; but I will. Saturday morning began with the discovery of The Yacht Club’s buffet breakfast: £5.99 and you won’t have to eat again until teatime, though I think it lasted me through to 10pm on both Saturday and Sunday. After a game of pool I stayed in the Sports Bar to keep up my record of having watched every FA Cup final since 1976 while JustHipper enjoyed A Hawk And A Hacksaw on the Pavilion stage. 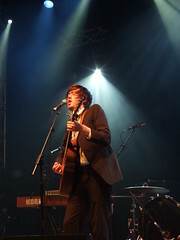 Portsmouth’s victory was followed by what was probably the set of the weekend, for me, by Okkervil River whose ramshackle intensity translated brilliantly to the big stage. 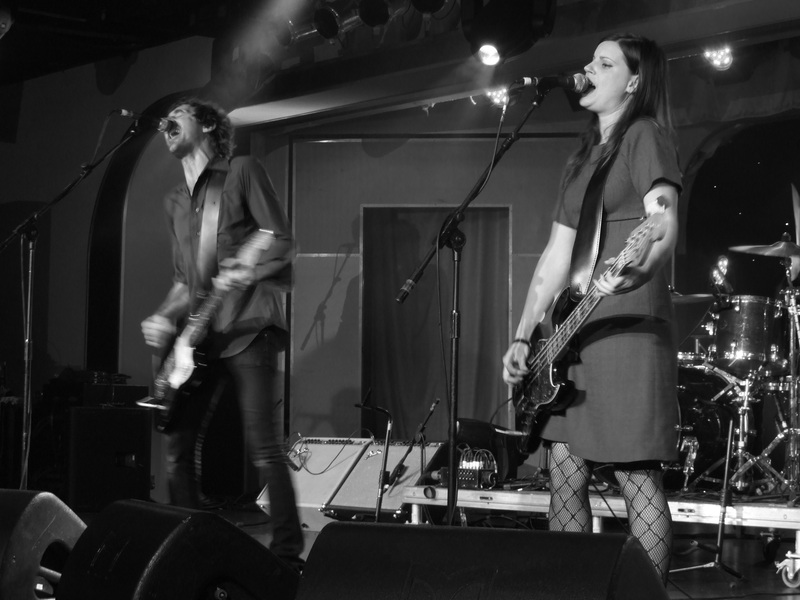 They seemed so much tighter and more focused than the couple of times I’ve seen them in club venues and they sounded positively epic, easily filling the huge space and no doubt gaining a number of new followers in the process. The electrifying “Black” and the gorgeous “A Girl In Port” were the undoubted highlights with Will Sheff in terrifically manic form, though the addition to the line-up of The Wrens’ Charles Bissell, albeit temporary, is a masterstroke, his taut, masterly guitar work perhaps the catalyst for their improved performance. 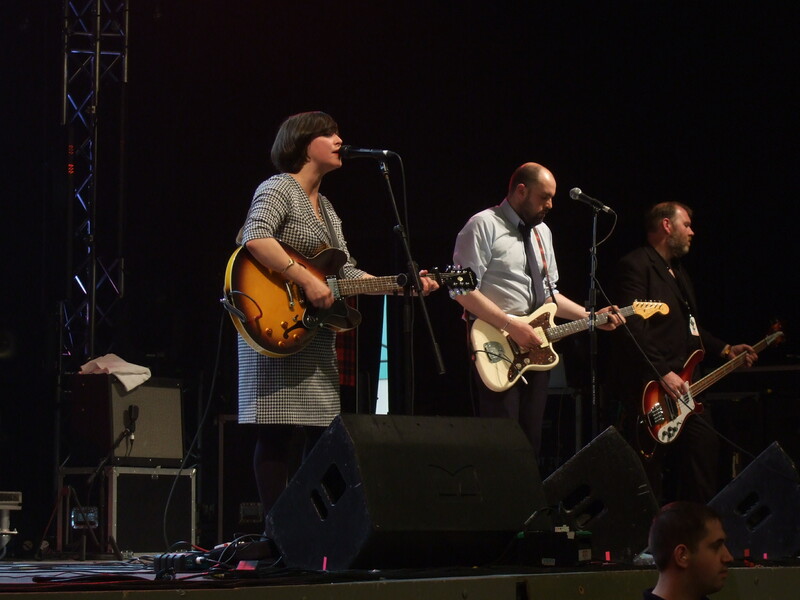 Next we had the first real clash of the weekend with And You Will Know Us By The Trail Of Dead playing the Centre Stage while Iron And Wine played the Skyline Pavilion. 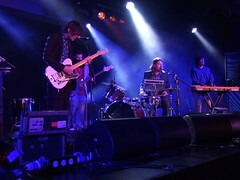 Having seen Iron And Wine in Manchester a couple of days before we opted for Trail Of Dead, usually an uncompromising live proposition though they have certainly lost their way with their last two albums. A couple of the oldies sounded great but the rest failed to hold our interest so we returned to the Pavillion to catch the last 20 minutes or so of Iron And Wine which seemed to consist of just one song: the 3 hour version of “The Shepherd’s Dog” that had got many peoples backs up, including ours, at the Manchester gig. Iron And Wine in extended folk jam mode is not much fun at all. 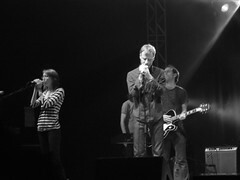 A Boxer-centric set from The National rounded off proceedings on the Pavilion Stage. It was captivating stuff and it was great to see them playing to such a large and enthusiastic crowd. The normally reserved Matt Berninger even ventured to the barrier for some Bono-style audience-milking. The Boxer songs sound so much better live, retaining the dark atmospherics of the record but when they break loose, like in the closing stages of “Start A War”, they take you places that the album doesn’t quite manage. I can’t say I remember too much about Western Keys on the Reds Stage later that night, except that I quite enjoyed them. 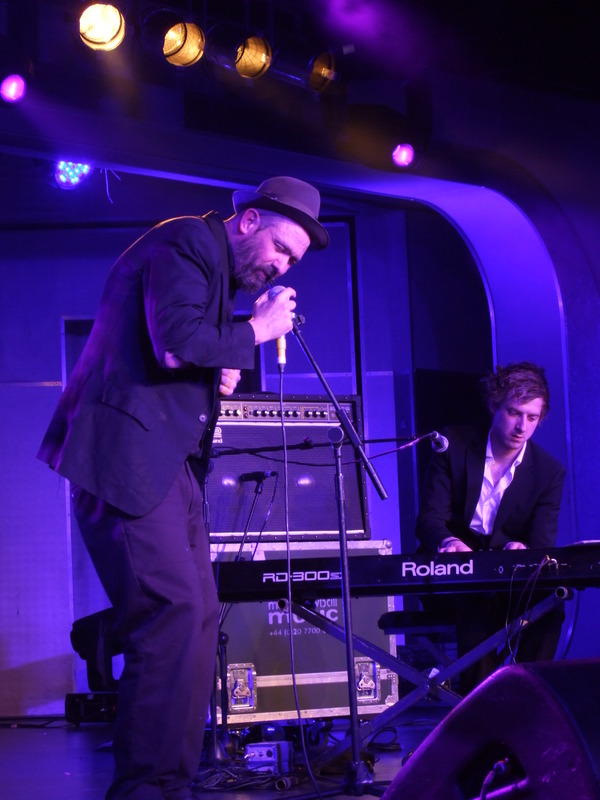 Poised somewhere between indie rock and Americana, they had pedal steel duelling with Charles Bissell’s taut, angular guitar work. I hope that Bissell guy was on double time. It was midnight and we were, again, dead on our feet. Battles would have to wait for tomorrow night. Sunday started with the breath of fresh air that is Jens Lekman. For me at least: JustHipper’s dislike of the Swedish pop maestro is legendary and she sensibly stayed well clear. With the bright sunshine filtering through the canopy of the Pavilion Stage and plenty of festival goers weary from the exploits of the past two days, it was the perfect conditions for Jens and his female-heavy backing band to spread some joy and blow away some of the cobwebs. The joyous “The Opposite Of Hallelujah”, with its excellent segue into “Give Me Just A Little More Time”, and the lengthy, ever-expanding story-song of “A Postcard To Nina” were memorable moments and Jens will have undoubtedly won over a few more fans. Not JustHipper, though, who I met up with to watch Polvo on the Centre Stage. We’d not really heard any Polvo before – they’d just reformed after about 10 years – and though they played perfectly serviceable ’90s indie rock, we decided to make our way back to the Pavilion Stage half way through to watch the last half hour of Beach House, whose laid-back dreamy pop was much more accommodating. I stuck around for Silver Jews while JustHipper made her way back to the Centre Stage to get some Atlas Sounds that almost sent her to sleep. The Joos were wonderful with David Berman on fine form, freed from guitar duties and able to prowl the stage at his leisure. Cuts from the new “Lookout Mountain, Lookout Sea” nestled comfortably alongside older classics such as “Trains Across The Sea” and “Smith And Jones Forever”. Berman entertained the crowd by reading out conflicting articles from an Irish farming newspaper. Seriously. Next it was back to the Centre Stage to see if seeing Animal Collective live would induce some sort of epiphany and I would suddenly realise what all the fuss is about. Nope, it’s never going to happen. Animal Collective bore me to tears. 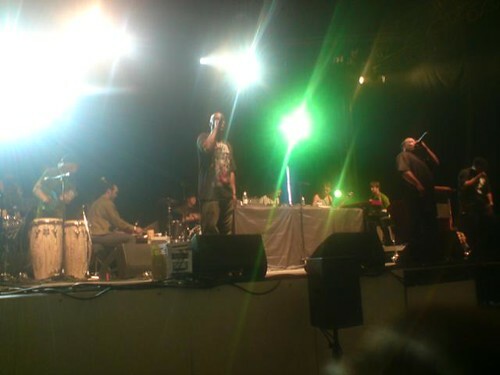 Back at the Pavilion Stage De La Soul were entertaining a sizeable crowd and were great fun until we started to realise that they were overrunning and that Broken Social Scene’s set would probably be curtailed as a result. In the end they incurred our wrath by being 30 minutes late getting off the stage, although I found out later that they were 30 minutes late coming on, so not entirely their fault. Broken Social Scene were certainly worth the wait, cranking out superb versions of “7/4 Shoreline” and “Ibi Dreams Of Pavement” early on and then getting an (inevitable) cameo from J Mascis, along with members of Explosions and The National, among others, for a tremendous “Backed Out On The…”. 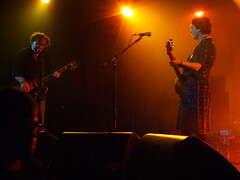 There was a strange hushed singalong for “Anthems For A Seventeen Year-Old Girl” with the ever-enthusiastic Amy Millan leading proceedings while the closing “Major Label Debut” was a great way to finish things off. They may have only played for just over an hour but it was a wholely edifying set. 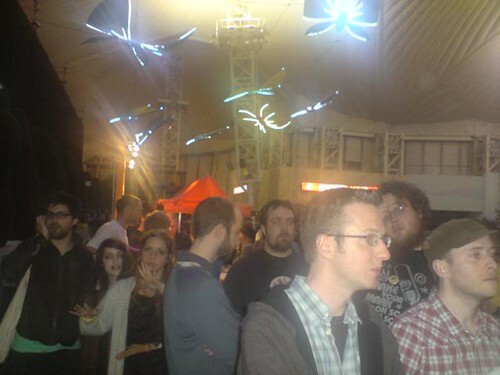 It remained for us to grab a pizza and then join the queue for Battles on the Centre Stage. In a farcical move, people who had got to the Centre Stage early to be sure of getting to see the band, were cleared out of the venue after Lichens’ set finished and had no option but to join the back of a very long queue to get back in. Most of them probably didn’t. In another twist, people who got turned away from Battles’ performance the previous night were given blue wristbands and allowed to the front of this queue. Fair enough, but where were our wristbands? We didn’t try to get in last night but surely we should have had preference above anyone who did see the band’s first set. Then, just as we were bemoaning the whole shambles, a girl appeared out of nowhere and asked if we wanted a couple of blue wristbands that she had spare. Thus, we made our way to the front of the queue and into the venue, taking up a decent spot at the barrier. We would have probably got in anyway but that girl really made our weekend. Anyway, Battles were quite incredible and enjoyed perhaps the most enthusiastic crowd of the weekend, which wasn’t bad for the early hours of a Monday morning. How they do what they do, I don’t know. 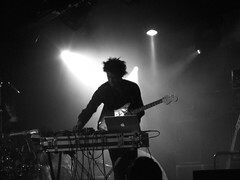 Their set was a mass of complex loops, samples, vocal trickery, live guitars and incredibly tight and energetic drums. It was a great end to another great ATP weekend, and I’m sure we’ll be back for more next year. 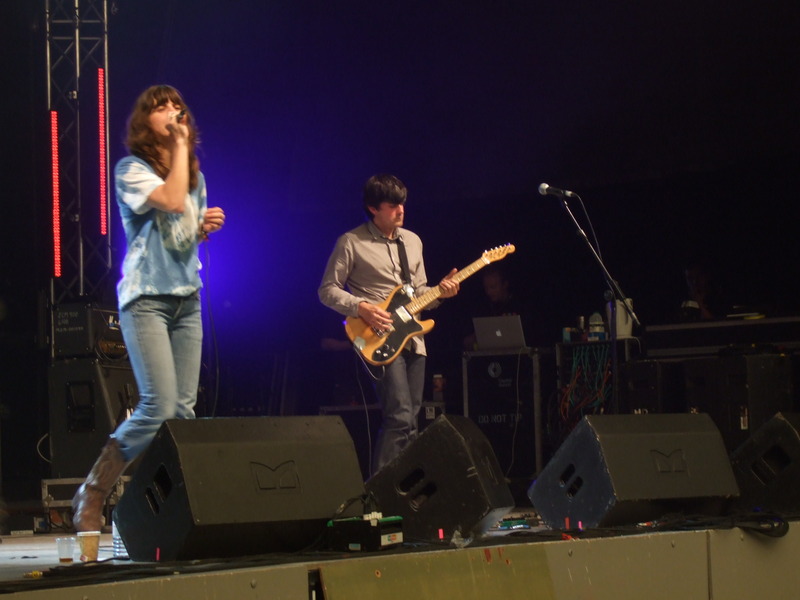 File under all tomorrows parties,atp,battles,broken social scene,dinosaur jr,explosions in the sky,Festival Reviews,Gig Reviews,jens lekman,mp3,okkervil river,Reviews,the national. File under all tomorrows parties. I wonder if Battles are remotely aware of all the pallaver outside? The room got cleared so people who’d been waiting for hours ended up at the back of the world’s longest queue so people who got turned away last night got priority to get into the gig. This could have been avoided by wristbanding everyone for their chosen night of Battles at check-in. The queue for Battles goes as far as the eye can see. 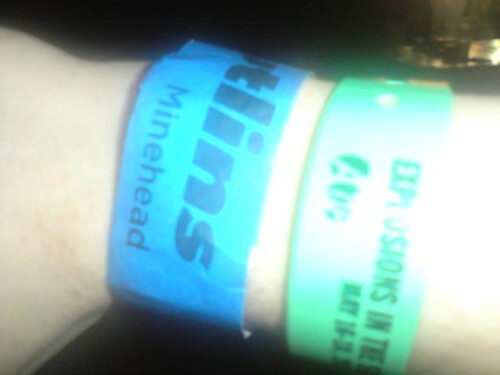 People who got turned away last nite got wrist bands. People who didn’t stay up for a 2am set had no idea. That’s 95% of the crowd. Why weren’t wrist bands given at check in on Friday? Broken Social Scene on the Pavillion Stage. Yay! 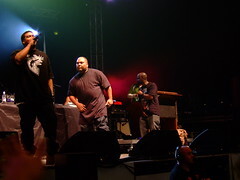 At one point I thought De La Soul were just going to keep going and we’d never see Kevin Drew, Amy Milan and co.
De La Soul running 30 minutes over on the Pavillion stage. It was good for 15 minutes. Now it’s tiresome. Go now so we can watch Broken Social Scene please. Atlas Sound on Centre stage at ATP. 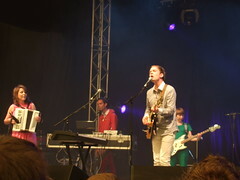 Atlas Sound on Centre stage at ATP. So mellow a nap seems a good idea.